The American College of Greece | Thank you ACG Supporters for your generosity over 2018! Home » Why Give » Gifts of Note » Thank you ACG Supporters for your generosity over 2018! Thank you ACG Supporters for your generosity over 2018! The American College of Greece is deeply grateful to the many people, organizations, and companies whose inspiring and generous support during several landmark eventsover 2018 was key tothe success of a number of important initiatives, benefiting students, the wider ACG family and community. Some dedicated their time and energy, others donated gifts or/and services, together all our ACG supporters – students, staff, parents, alumni and friends – inspired us with their generosity that was instrumental to the success of several events held to support educational opportunities and major causes in the community. ACG’s supporters were instrumental in helping raise €57,000 in cash and in-kind donations – including travel-related services and other generous gifts – during the well-attended 2018 Pierce Christmas Bazaar held December 14, which this year centered on the theme of “Love, the Warmest Clothing.” These generous funds are used to boost Pierce’s educational opportunities, helping provide scholarships and financial assistance, as well as towards charity organizations in need in our community. During the event, close to 2,000 guests, students, parents, staff, alumni and friends joined in the Christmas spirit. Some chose to donate clothing and bed linen, others manned stands offering home-made cupcakes and Christmas crafts for a host of good causes, while all guests enjoyed tasty international food, a stellar student theater production and other fun activities – such as Black & Decker arts-and-crafts workshops. Guests were also keen to try their hand at the popular lottery – featuring a slew of lovely gifts and services, which several companies and individuals generously donated. ACG is grateful to all for their hard work and time towards making the beautiful Pierce fairytale Christmas Village with a sea of picturesque wooden Christmas houses, a reality, and for all those invaluable contributions towards the Pierce Scholarship Fund and to the Social Community Soup Kitchen of the Agia Paraskevi Municipality. ACG would also like to warmly thank its supporters for their gifts and other generous donations during the annual celebratory event Pierce Open House, last year held on April 21, which raised an inspiring €98,000 in cash and in-kind donations. Visited by close to 3,000 people, the student-organized event showcased the best of student initiatives in support of students and non-profit organizations – in line with the school’s motto, “Non ministrari, sed ministrare – To serve, not to be served.” The Open House celebration is a Pierce tradition engineered and operated by Pierce students who at every turn promote a culture of philanthropy and social responsibility. Proceeds raised from the event were used to boost the Pierce Scholarship Fund, as well as three non-profit organizations – the Wing of Abandoned Newborns at “Alexandra” Hospital, the Autism Center SOS Acharnon, and the Social Community Soup Kitchen in the Agia Paraskevi Municipality. The Deree Open Fest, held June 8-9, was also a successful event thanks to our thoughtful supporters, whose generous contributions were used to enhance the Deree Scholarship Fund, providing financial assistance and scholarships in order to help students thrive. Guests enjoyed music, food and drinks, generously provided by various ACG supporters, while a Tech Fair showcasing cutting-edge products and services from a host of sponsors provided guests the opportunity to learn about all the latest technologies and how to use them. Guests also enjoyed a slew of wellness services, kids’ activities, alumni sports games, and many more fun activities. 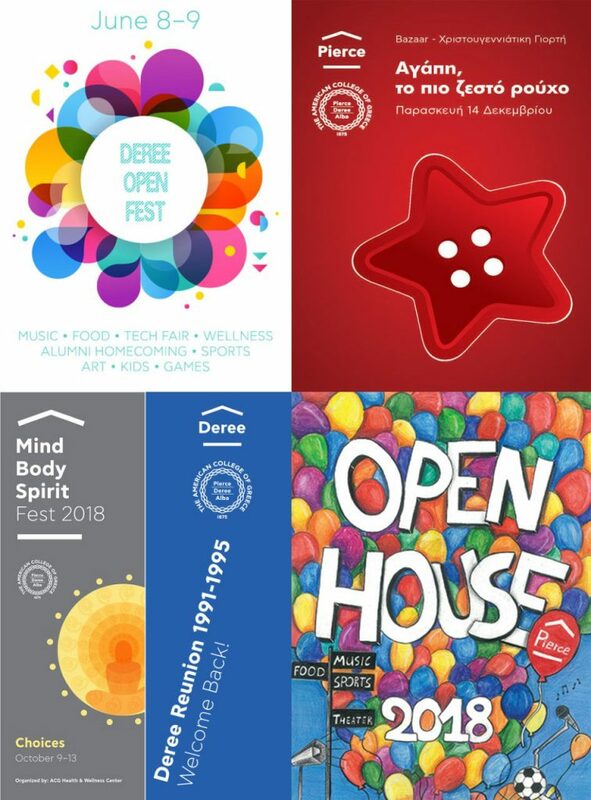 ACG would like to warmly thank all our generous supporters, including all those companies, students, their parents, staff and alumni, who donated their time, services and gifts-in-kind to make the Deree Open Fest such a memorable and successful event. Following the Open Fest, Deree also hosted the Deree ‘91-‘95 Reunion, welcoming hundreds of enthusiastic alumni, staff and friends of ACG for an unforgettable walk down memory lane, which included campus tours with former student orientation leaders, as well as several exciting sports and creative activities. The day culminated in a party that lasted until the wee hours. Back on campus after so many years, Deree ’91-’95 alumni – some of whom came from abroad – were delighted to rekindle friendships as well as forge new ones, capping a fun-filled, memorable day for the Deree community. A big thank you to all our ACG supporters for your invaluable help – including several wineries, food, beverage and other vendors, the Alumni Committee volunteers, and many more. ACG would like to thank its generous supporters who were key to the ACG Health & Wellness Center’s organization of its annual Mind, Body, Spirit Fest, this year held on October 9-13, centering on the theme of “Choices.” Featuring workshops in Jin Shin Jyutsu, Tai Chi and decompressing the spine, talks on making the right choices to lead healthier, mindful lives, as well as environmental displays on helping the planet, and fun, career-choice games, the Mind, Body, Spirit Festival at Deree was a success due to the generous and invaluable help of sponsors, such as Sklavenitis, Meli Attikis, Cocoon urban spa, and De’Longhi Kenwood. Numerous alumni and former professors also generously offered their time and shared their knowledge as guest speakers. A big thank you to all our supporters!